A command center is any place that is used to provide centralized command for some purpose. While frequently considered to be a military facility, these can be used in many other cases by governments or businesses. A command center is a central place for carrying out orders and for supervising tasks, also known as a headquarters, or HQ. Common to every command center is three general activities: inputs, processes and outputs. The inbound aspect is communications (usually intelligence and other field reports). Inbound elements are "sitreps" (situation reports of what is happening) and "progreps" (progress reports relative to a goal which has been set) from the field back to the command element. The process aspect involves a command element that makes decisions about what should be done about the input data. In the US military the command consists of a field- (Major to Colonel) or flag- (General) grade commissioned officer with one or more advisers. The outbound communications then delivers command decisions (i.e. operating orders) to the field elements. 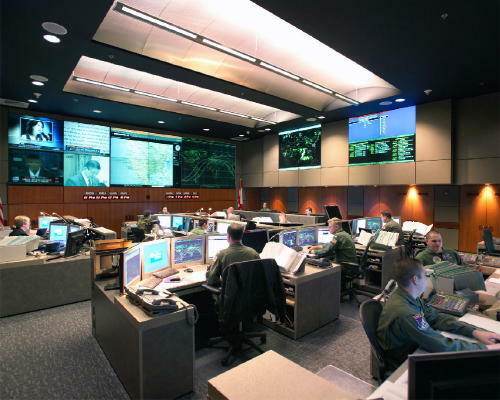 Command centers should not be confused with the high-level military formation of a Command. However, Commands may be controlled from a command center.